Now it’s time to start naming functional groups! We’ll start with alkyl halides because they are some of the easiest to name. So I've got some good news. We're all done with alkanes. The bad news is that now we have to add some functional groups to the mix. The first and easiest one we're going to start off with is alkyl halides. Alkyl halides are simply named by adding them as a substituent before the root chain indicating their location. What that means is that remember that at the beginning of this lesson we talked about substituents and modifiers; alkyl halides don't have modifiers. They're just called substituents just like an alkane would be, like an alkyl or whatever. One thing we should note is our prefixes for these different halogens. So fluorine would get the prefix fluoro-. Chlorine gets the prefix chloro-. 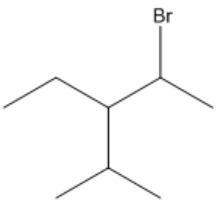 Bromine gets the prefix bromo-. And then iodine gets the prefix iodo-. These are going to be the prefixes that we use to assign the name to the alkyl halide. The next thing that you should note is that alkyl halids have no priority, zero priority, when it comes to numbering the direction of the chain. What that means is a lot of people think, “Oh, I've got this long chain and this side has a chlorine on it so that must be the side that has the 1 that I start from.” No, not at all. Use the same rules that we did before, just you look at the closest substituent. It doesn't matter what it is. It could be a chlorine. It could be a methyl. It doesn't matter. You still make the chain start from the side that has the closest substituent. So what I want to do is apply this to this alkl halide (a). Go ahead and try to solve it out on your own first. Draw it out. And then when you're done, you have your answer figured out, then go ahead and go to the next video. Alkyl halides are named as substituents, not modifiers (they are named before the chain, not within it). Alkyl halides don't get priority when deciding where to start numbering a chain. We must start with the closest substituent. All right guys, so this one is actually similar to one that we did earlier where it kind of looked like a tert-butyl, but it wasn't. My longest chain would look like that. That would be, it looks like six carbons. 1, 2, 3, 4, 5, 6. So my root is going to be hexane. Now I have to decide which one gets the number 1. Is it red or is it blue? For this, I need to go ahead and see which one has the closest substituent. Red has a substituent on 2. Blue has a substituent on 2. So far there's a tie. So then I go to the next substituents. Red has its next substituent on 5. Blue has its next substituent – I keep doing that – still on 2 because there were two methyls in that location. It turns out that even though the iodine is all the way over here, my number 1 is still going to be the blue. What that means is that now I look at substituents. For substituents, what do I got? I've got a 2,2-dimethyl and it looks like I also have a 5-iodo. Now all I have to do is piece that together. In terms of alphabetical order, which one would come first? Remember, di doesn't count, so I look at 'm' versus 'i' and 'i' comes in the alphabet first, so it would be 5-iodo-2,2-dimethylhexane. Not so bad right. Hopefully, if you have questions, let me know. But if not, move on to the next question. I'm just going to let you guys know, the hardest part about the next question is actually just figuring out which chain you're going to use. So I want you guys to pay extra careful attention to that because this one's a little bit tricky. So go ahead and get started. Reminder: Always select the root chain before moving onto common substituents! Even though alkyl halides have no priority in numbering by location, they still have priority in alphabetical order. Yeah, I know that one sucked. Sorry, just trying to help you guys kill this topic! For each of the following structures, give a complete systematic IUPAC name. Be sure to indicate stereochemistry where this is pertinent. Tell what is meant by an homologous series and illustrate your answer by writing structures for an homologous series of alkyl halides. In a search for fluorocarbons having anesthetic properties, 1,2-dichloro-1,1-difluoropropane was subjected to photochemical chlorination. Two isomeric products were obtained, one of which was identified as 1,2,3-trichloro-1,1-difluoropropane. What is the structure of the second compound? Provide the complete IUPAC name for the following structure. Give systematic (IUPAC) name for the following compound Spell out the full name of the compound. What is the name of this compound? 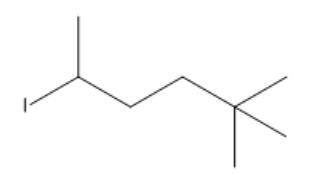 What is the IUPAC name for the substance whose structural formula is given below? Which is the correct name of the following molecule? What is the common name for the following compound?